Waiting for a Floc and Armagnac tasting at La Boubee where M Lavadeze is passionate about his metier. Three souvenir watercolour paintings of a medieval tower at Fources. Sorry none are for sale - the Guggenheim already has options on them. Tant pis, the gates were shut when we arrived for an early morning wine tasting. He's explaining how they make the bubbly stuff. And here we are with the guy who invented Pousse Rapiere, an appero the second in a row of which makes you feel as if you've been pierced with a rapier. And not many are left standing after a third. A picnic lunch at La Romieu where the cats saved the village in the middle ages. (Ask us about it when you see us). In between the three frugal meals we have each day, we sometimes need a snack. enough money for me to do so). We think the fat guy in green is the driver. Camembert, comte, St Agur, Brie de Meaux, Roquefort, brebi, or Morbier? Oh let's just take a slice of all of them. One of the four gateways into the bastide village of Vianne. And there's always time for more shopping - no matter what. A team shot at Nerac port on Saturday morning. We were so busy eating that no one noticed that a meteorite had dropped into our midst. This is the start of the walk to Mezin from Poudenas for the Sunday morning market. Waiting for something in Lectoure. Must be nearly lunchtime. Guess what their wives call them? 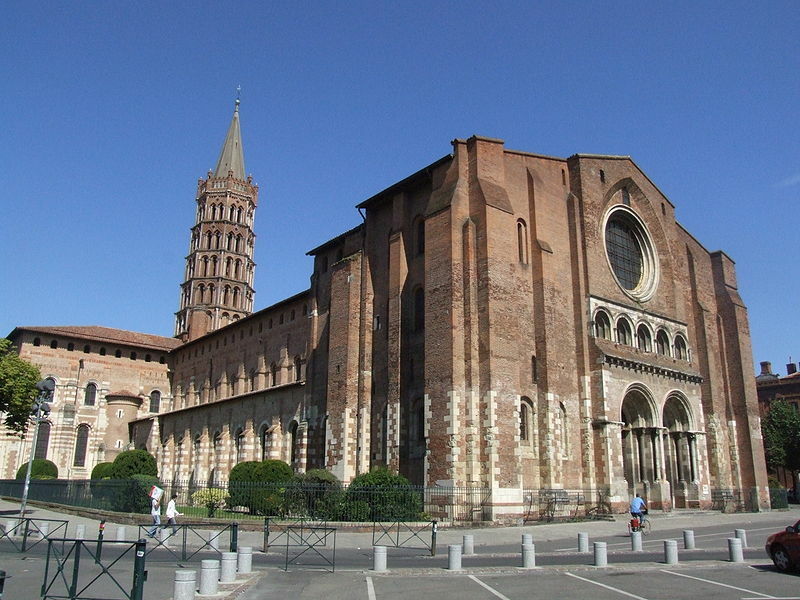 Toulouse is France's fourth largest city after Paris, Marseille and Lyon. We went there for the day, and here are just a few of the things we saw. Taking a break on the banks of the Garonne which flows to Bordeaux and into the Atlantic. Looking into a conveniently placed mirror to see the palm arch detail in the Church of the Jacobins. 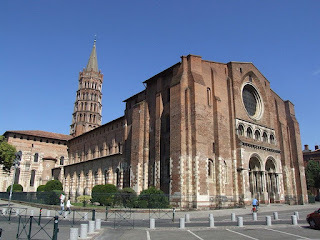 Saint-Sernin, the largest romanesque basilica in Europe, built to serve the pilgrims on the Road to Compostella. A coffee break looking out on the rooftops of Toulouse at Galeries Lafayette. 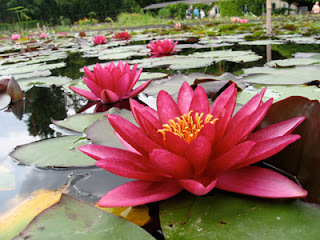 Here are some of the gang at Latour-Marliac, the French National Waterlily Collection. Before Latour-Marliac came along in 1875, water lilies were only available in white. But he changed all that, and supplied Monet with water plants for his garden at Giverny near Paris. This is the question I'm often asked by my French petanque partners. In case anyone's forgotten, condom is the name for a little contraption that men wear as a birth control mechanism. Think of it like a raincoat. It's also widely used to prevent AIDS. Unfortunately, some silly people don't think they work in either case. The word condom is meaningless in French and French people don't understand why we find it funny. Anyway, here we are having a picnic near the river at 'English Hood' or Condom, depending on which language you're speaking. And here's a photo of the statue of some musketeers and lots of Aussies. Carcassonne is the largest fortified bastide in France, but it's a long way away, so here we are at Larressingle, which is the smallest bastide in France. (If you've been following carefully, you'll all know what bastide means by now). A shot of part of the team just outside the walls in the bastide town of Montreal. A rose amongst the thorns in Montreal. Our first picnic and team photo outside the walls of the round bastide town of Fources in the Gers. A note for the history buffs. Bastides are fortified new towns built in the Middle Ages as a determined effort to colonize the wilderness, especially of southwest France which was a frontier region that belonged partly to France and partly to the kings of England. Almost 700 of these new towns were built between 1200 and 1400. Obviously, the built environment of the more important bastides has been significantly modified since mediaeval times, but in many of the more rurally sited bastides, the layout of streets and buildings has remained virtually unchanged for over six centuries. Sadly, Group One left us just after this Armagnac tasting and picnic lunch. Bon voyage, Group One. 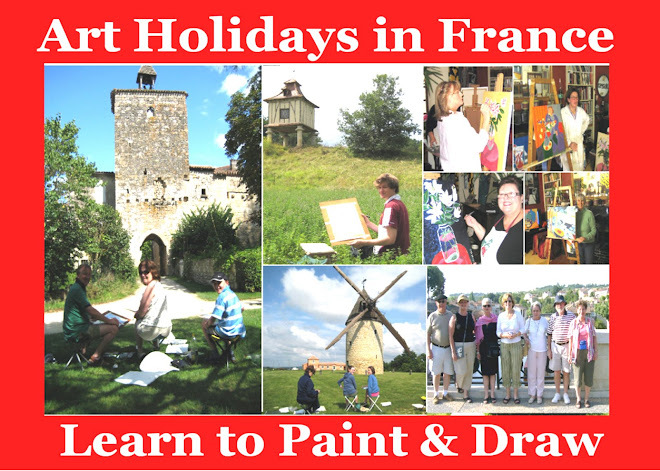 Happily, Group Two Arrived - Bienvenu, Group Two, hope you have a great stay in Gascony. Mmm, which one shall we try? The great cité medieval of Saint-Emilion is in the Gironde just north east of Bordeaux. The whole town is classified a World Heritage site. The Romans planted the vineyards in the 2nd century. It's a simply wonderful place to visit. Here are some pics of our day trip: Lynne and Lynne and a team shot looking out over the rooftops. Barbaste is Henri IV's fortified mill that exported flour to French possessions in the Caribbean in the middle ages. And a picnic on the river at Lavardac. When Eleanor of Aquitaine married Henry Plantagenet (later Henry II of England), Saint-Emilion became part of England. The town changed hands repeatedly in the course of the Hundred Years' War until 1453 when it became French permanently. Saint-Emilion produces only red wine. As most of its wine is based primarily on Merlot, St-Emilion wines are described as having finesse and elegance. The best wine of the region can last upward of 10-20 years and many find that the wines here mature earlier than those based on Cabernet Sauvignon. The soils in the area differ greatly, from gravel to limestone to clay and sand. As a result, the wines of this region are diverse. Quality wines display silky tannins and ripe, soft fruit – the higher quality wine showing full-bodied texture and layers of complexity. As you can see, when we're not eating, we're drinking. So here we are at the Chateau of Monluc. And the reason we're here is because, amongst other lovely things, it produces pink champagne (even though you are not allowed to use that word). The Chateau is where the well known Pousse Rapier cocktail is produced. One third Pousse Rapier and two thirds pink champagne. Wow! Vin de pays, other sparkling wines and armagancs are also made here, so there's lots to taste. Really well worth the visit - especially with designated drivers. In between breakfast, lunch and dinner, we were feeling a bit peckish, so we thought we'd just try a few of these little numbers at the Cigale Chocolate Factory in Nerac. And here we are on the banks of the Gelise after spending the morning at Nerac market buying what we're going to cook for dinner. Here's the menu at Les Deux Gourmands. Amuse-gueules - sorry, that's a bit rude. Starter: melon and watermelon, salmon riettes, foie gras pate. Entree: Foie gras terrine with figs. Fish: Merlu with bacon and a red pepper sauce. Main: Magret de canard with gascon potatoes and carrot cannellees. Afters: an amazing passion fruit delight which is far too complicated to describe. Plus, as usual, a few glasses of local red and white wine from nearby vineyards of course. (Sorry some of the French words should have accents, but that's all too hard).